I am continually surprised at the new things that I learn about my camera. Despite having read much of the manual and used my Canon EOS 60D for more than 18 months, there are still a few tricks that I keep coming across. I was taking some indoor photos in low light yesterday. The autofocus was not locking because of the low light and lack of contrast in the composition, so I switched to manual focus. Out of habit, I half-depressed the shutter button while I was turning the focus dial. Low and behold, one of the focus points in the viewfinder light up and the camera beeped as I adjusted the focus manually. I went to the manual to find out what was going on, and sure enough, if you depress the shutter halfway while in manual focus mode, the autofocus sensor will alert you when you have achieved focus on one of the AF points. This is a handy feature for me, because I normally wear glasses, and I sometimes find it hard to see accurate focus using the viewfinder. That small amount of assistance from the AF system could prove very helpful! Many DSLRS have an auto-ISO or auto-sensitivity feature that adjusts the ISO setting of the sensor automatically to compensate for changes in lighting conditions. This is a handy feature when in an automatic exposure or program mode, as it means that your aperture or shutter speed settings won’t be as limited by the available light. When shooting Aperture (Av) or Shutter (Tv) priority, this can be very handy. If I want to keep the digital noise level under control, I can always set a maximum ISO for the Auto-ISO feature. The problem with Auto-ISO, at least on my Canon EOS 60D, is that it is on by default, even when shooting in Manual (M) mode. 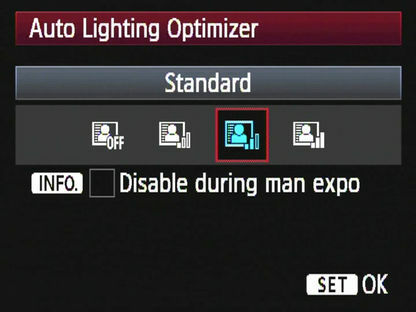 This effectively turns Manual mode into a dumbed down Auto-Exposure mode, since the ISO setting will adjust to try and give the correct exposure no matter what aperture or shutter speed you set. This can be a pain if you are using Manual mode to manipulate the exposure above or below what the camera’s meter recommends. There are other opinions on this. For instance, I found this article, “An In-depth Discussion of M + Auto-ISO for Canon SLRs” in which the author argues that Auto-ISO should be the norm, even for manual shooters. Personally, I will need to experiment more before I buy that argument. For those of you with a late-model Canon DSLR, other features to become familiar with are “Auto Lighting Optimizer” and “Highlight Tone Priority.” These features are relatively recent and probably poorly understood. Suffice to say that they are designed to correct exposures when lighting values are out of range of a good exposure. Highlight Priority Mode will attempt to correct blown out highlights, while Auto Lighting optimizer will attempt to even out the luminosity of the overall exposure. While these features can help to prevent common, but annoying exposure errors, Canon’s manual warns that they can also lead to unexpected results when manually overexposing or underexposing a composition. I’ve been following an interesting conversation on the Macintouch web site and the relative merits of digital vs. analog (or “wet”) photography. As someone who learned photography on film about 30 years ago, the discussion resonates with me. While digital photography lacks some of the tactile qualities of film photography, I feel much more free to experiment and to make mistakes. Once my equipment is paid for, each exposure is effectively free, whereas in the film days I was forced to be selective about each picture I took because of the cost. With tools like Aperture and Photoshop, I have very fine control over how my photos turn out, and I can sometimes undo the damage caused by bad exposures or other factors. Here’s the link: Photography: Commentary.